I bike. I love my bike. In a fit of black humor over the vastness of the number 5 in these circumstances, I decided it was time to address the issue. And what can a civically-unengaged citizen do? Join the LACBC! And what can a chronically-cheap graduate student do? Ask others to fund his membership! And how does black humor enter into this? I have designed tiny (1") buttons to commemorate being hit by a car; think of them like football helmet stickers, but for cyclists, and not for good plays. It's a pile of buttons! It's as simple as that. Since nearly everywhere else charges monthly or listing fees, we're rolling PayPal. (2) So what are you waiting for? It's only $1.85 for the warm feeling of charity and a button. Each button costs roughly $0.30, a stamp costs $0.45, and an envelope is no more than $0.15. Paypal is going to take $0.30 plus 2.9% ($0.05). So with your $1.85 purchase, $0.60 will be directed to my membership fund. Inasmuch as I have 100 buttons and a student-level membership is $15, there's some wiggle room here; the remainder will either be straight-up donated or, if you're interested, contact me in the comments or by email and maybe we'll get you a membership, too. Of course, if you buy more than one at a time that math isn't exactly accurate. The truest statement is, whatever comes in beyond costs will go to the LACBC. The raw design for the button is an eminently-editable SVG file. You are welcome to modify it as you see fit. I won't bother choosing a license for usage but there is one unalterable — and unenforceable — qualification: you cannot make more than incidental profits off of derivations of this design. Use it for charity or for ingratiating yourself to charity (a generous description of my use case), but don't financially enrich yourself off the product. The easiest targets for customization are the background color (but red is so dramatic!) and the city name (based on reports from friends, SF and PDX would be a good start); honestly, the font selection is also wanting. It is left to you to use your imagination. Immediately after posting this, I went for a walk around the neighborhood. As I passed the local Valero, an older gentleman was waiting to pull out into traffic. Ten seconds later, I heard that gut-rending crunch that we are all too familiar with; I turned around to find that he had driven straight into a telephone pole (at low speed, as it had previously been three feet in front of him). He immediately backed up, put the car back in drive, and pulled out into the aether. That he is a likely neighbor makes it somewhat clearer to me how I could have been hit so many times. Unfortunately, people I care about keep getting run over. 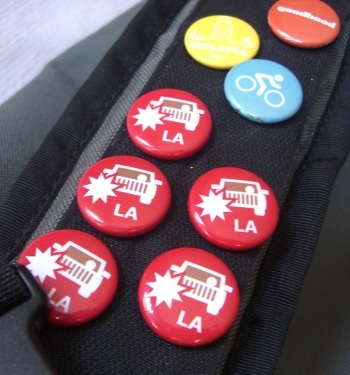 The LA buttons worked for a few of them, but for others some more customization was necessary. If you're interested in buttons for Colorado or Washington state, here you go. They have their own little edits, subject to my whims at the time. Side note: yes, it is sad that I (have to) keep making these. Hopefully there's no need to make an NC one anytime soon. Love it! I'll take 4 and hitcha up in-person to save on costs. Sorry, further commenting on this post has been disabled. For more information, contact me.